With so much opportunity for great brand awareness, you’ll want your Instagram photos to stand out from the crowd. Further incentive is provided by the fact that Instagram will be rolling out its Instagram Shopping feature for eligible BigCommerce businesses starting in Q2 2017, which allows viewers to find and buy the products they want directly from Instagram. Below are a few strategic steps to take photos that will help you increase your followers, boost audience engagement, and ramp up selling power. For more tips check out CPC Strategy’s list of Shoppable Instagram Best Practices. What kind of product photos should I take? You’ve created an Instagram account and are ready to start posting—but you aren’t sure where to start. Don’t worry, you have plenty of options. It doesn’t matter if you just opened your business or are a 20-year veteran, it’s easy to reach your audience on Instagram. As an owner or representative of your company, you have an inside lens into various aspects of your store. Sharing this view can add tremendous value to your customer–especially if you keep their interests in mind. Imagine you are a marketer at Nike and you want to promote or tease a new product. One of the first steps you should do is review the calendar. Do you have a new product launch or announcement coming up? Is there a major event or holiday that will be relevant to your audience? This will help determine your supporting content and the product you should choose to showcase. The World Cup is the biggest worldwide sporting event this summer. It will be trending globally across various social media channels. Since Nike is a leader in the sporting goods industry, this is a great opportunity to connect the brand with one of the world’s most popular sporting events by sharing relevant content to help drive the conversation. With a vast inventory of jerseys, shoes and other soccer-related equipment, your team decides to showcase these items in creative ways that capture the spirit of the games and light sparks in your customers’ hearts. Your photos need to captivate your audience in a creative way. Remember to think about the story you want your pictures to tell. Study the event and the demographics involved. Learn more about the sport and the passion that drives the athletes to greatness. The World Cup is a worldwide month-long event, which means you have the opportunity to post relevant content for an extended period of time. Nike can share numerous relevant product photos from around the globe showcasing their influence on the sport and the cultures they reach. All of the photos have been taken and you’re almost ready to share them. Now it’s time to find hashtags that will be published with your photos. Do your research and search across Instagram to determine which hashtags are trending. This will help your content gain exposure to thousands if not millions of new potential followers. You should also choose your own campaign or brand-specific hashtag so that all of your posts will be easy to find by other users. Just make sure they aren’t used by a competitor or bring up existing photos that might not be appropriate for your audience. You’ll also want to write captivating captions for the photos. Think about things will play into your story or resonate with your audience. 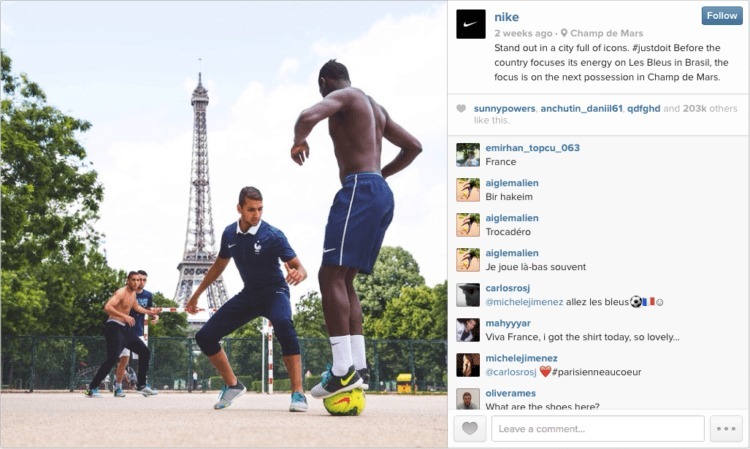 Nike’s brand has been build around inspiring people to do more–and their captions are equally inspirational. Over a month’s time, the World Cup will host several games. That’s a great opportunity to coordinate new photo posts before, during, or after the games. To stay fresh and regular, you’ll want to have a posting schedule or calendar created. And while there are some apps available to help you pre-schedule your posts, remember that spontaneity and timing are everything on Instagram. Depending on the importance of the game, the teams involved, or surprise outcomes that may arise, the Nike team should be prepared to share content in real-time for greater engagement. Photo by Jay Wennington used under Creative Commons. Sean Couch is a digital strategist with a strong entrepreneurial spirit that keeps him highly motivated and open to challenging himself in new and exciting ways. He also is a huge photo and video enthusiast and co-founder at SceneScout, a mobile app created to help professional photographers and videographers scout locations, plan, and share their work.